Fascinating Rhythm – FOUR chorus harmony! Posted 17.07.2017 by Fascinating Rhythm & filed under News. 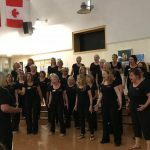 With the addition of Black Sheep Harmony who became LABBS members this year we are now up to four choruses in the Bristol/Cotswold area. 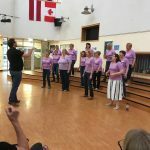 Each Musical Director (Craig Kehoe, Alex de Bruin, David Proud & Jo Dean) led a warm-up, all of which were enjoyed as we love to learn new warm-ups (wonder if we will remember them?) and we were then entertained with 3 songs from each chorus. 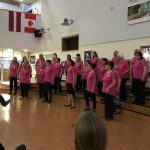 Avon Harmony started proceedings off followed by Black Sheep Harmony – we were then able to enjoy a large supper, with cake of course, which went down really well whilst a large raffle was drawn. We were then able to enjoy Bristol Fashion entertaining us and we finished up by singing to the other choruses at the end of the evening. 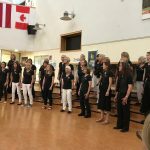 Another great evening with us all joining in harmony – good to catch up with old and new friends who all share and love this thing called barbershop.